Air strikes against Colonel Muammar Gaddafi's "command and control centres" in Libya are "wholly legitimate", Foreign Secretary William Hague has said. 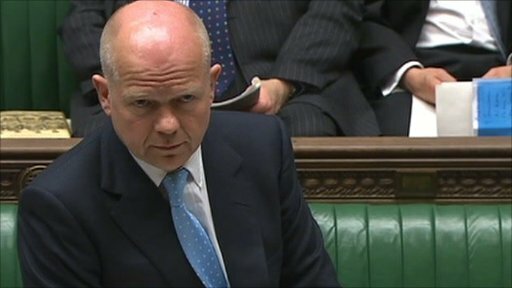 At question time in the Commons on 3 May 2011, Mr Hague told MPs that "there must be a political settlement" in Libya, calling again on the Libyan leader to step down. British military officers were working on the ground helping the rebels to establish headquarters and organise their resistance, he added. Colonel Gaddafi's youngest son, Saif al-Arab, was killed in an air strike, along with three of the Libyan leader's grandchildren, in Tripoli at the weekend. Labour's David Winnick asked: "Considering the killing of one of Gaddafi's sons and his very, very young grandchildren, is it not the case now, despite the denials that have been made, that first and foremost it is regime change that is the policy of Nato - and secondly the policy is to kill Gaddafi himself?" Former leader of the Liberal Democrats Sir Menzies Campbell suggested that the government risked losing the support of the Arab League if it appeared that it was now targeting Gaddafi. Shadow foreign secretary Douglas Alexander asked Mr Hague whether the United Nation's mandate for military action in Libya excluded "the direct targeting of individuals". But Mr Hague said that individuals were targeted according to "how they behaved" and if they were "part of command and control centres". He added: "I don't think it is right to provide a running commentary on targeting, nor is it militarily sensible to do so."